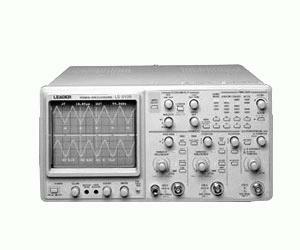 Top of the line Leader LS 8106A offers speed and operating shortcuts found in very few modern scopes. Examples include Auto Setup in which a single touch automatically sets both V sensitivity and timebase for instant, optimum waveform display. Another great convenience is a continuous on-screen readout of the operator choice of frequency or period and Vp-p or DC level for signals handled in CH1.